Two years ago, I didn't even know what kale looked like. When my roommates and I started getting Community Supported Agriculture shares from Fairview Gardens, I discovered a slew of new vegetables like turnips, rainbow chard, and green onions - but kale is my favorite. It just makes anything you add it to taste better. Usually I just grill it up in olive oil with whatever other greens I have lying around. But recently I've been getting creative with ingredients. A few weeks ago, I made this braised kale and apple dish. It tasted good, but I don't have much experience braising things, and I am pretty sure my kale got a bit too brown. So this afternoon, I decided to experiment with some other fruits: oranges and strawberries. I still had one orange left from my trip to Plow to Porch, and we got a little basket of strawberries in our CSA share yesterday. Would kale and fruit be enough? I opened the door to the refrigerator and saw a bundle of little root vegetables. I stared at them blankly (my default face when it comes to gazing into the refrigerator). They were too small to be beets and too reddish to be turnips. Aha - radishes! You might think it's depressing that I don't know a radish when I see one, but at least I know what a tomato looks like. Yesterday, my friend Than identified the hitch-kick as "the Goldilocks of dance moves - not too big, not too small, but just right." In case you don't know what a hitch-kick is, here's an incredible demo video. Following Than's fabulous analogy, a radish is the Goldilocks of root vegetables. Any bigger and it would be a beet. Any smaller and it would be... too small to care about. 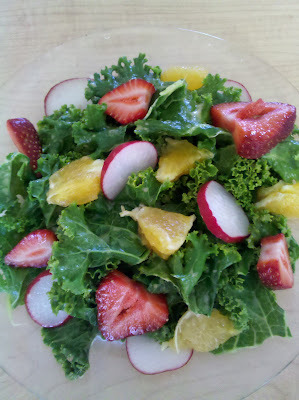 So I had my winning combination: kale, oranges, strawberries, and radishes. For dressing, I decided to use the carrot, ginger, and miso OM Sweet Mama dressing I had purchased at Plow to Porch. I wanted the kale to wilt a little bit, so I put it on low heat with just a bit of water and pushed it around. After about four minutes, I took it off the heat and drained it. Then I poured the dressing on top of it and spent a while mixing it in. Kale leaves are tricky because they don't really hold dressing the way that other greens might, so you have to either massage the dressing into them or (if you are weirded out by the idea of massaging kale) spend a while pushing them around in a puddle of dressing. It was quite tasty! I was so proud of myself for inventing a yummy salad recipe and for taking a lovely picture of it that I attempted a hitch-kick. That knocked my pride down a notch pretty quickly. I'm just going to stick to making salads. I'm mega impressed by this salad!!!! I love kale and this looks so summery and delicious ... meghan you are getting pretty fancy! xoxo! nom nom nom a salad with strawberries???? that would give it a sweet taste, I will have to try that, thanks for that awesome idea!